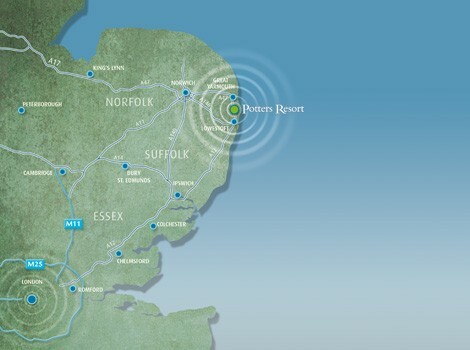 Potters Resort is situated in Hopton-on-Sea and set in 65 acres of beautiful coastline, on the border of Norfolk and Suffolk. Whilst there’s more than enough on Resort to keep you entertained throughout your Break, we are nestled between some traditional market towns including Great Yarmouth and Lowestoft which feature attractions such as Pleasurewood Hills Theme Park, Sea Life Centre, Great Yarmouth Pleasure Beach and Joyland. A few miles further you can find small towns including Wroxham and Potter Heigham for visits to the Norfolk Broads, or Norwich, a relaxed city great for shopping and sightseeing with attractions such Norwich Castle and Norwich Cathedral.